A journey to the farmland near Branbury, Vermont, where Fay Hubbard, in the aftermath of a painful divorce, has rented a house from distant cousin Homer Flint, planning to start a bed- and-breakfast and a new life. She gets some help in the rudiments of farm life from neighbor Ruth Willmarth, but tourists are scarce and Fay is happy when Kevin Crowningshield rents a room. He’s in the area to check on his wife Angie, one of several women living in the nearby so-called Healing House, a property Angie had inherited, to the frustration of eccentric Alwyn Bagshaw, who owns the abutting acreage. Meanwhile, Homer Flint’s Aunt Glenna, scheduled for a nursing home but fighting it all the way, has moved into Fay’s house, her old home, with her young niece Hartley. 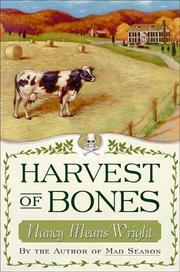 On top of this, a skeleton has been unearthed on Ruth’s land that could be Glenna’s husband Mac MacInnes—unheard from for years. Colm Hanna, part-time policeman and son of the local mortician, is assigned the job of finding MacInnes in New York. He succeeds, bringing Mac back to Vermont and tackling the daunting job of identifying the skeleton and figuring out who buried it and why—all this complicated by some scary happenings at Healing House. The author’s vividly offbeat characters and her warm accounts of life on the farm are more convincing than the elaborate plot, but, overall, this is a solid follow-up to Wright’s promising first outing (Mad Season, 1996).